Postcard from Hawaii: Aloha from Paradise! Weather said it will be 28 degrees celsius, but felt like it was 23. 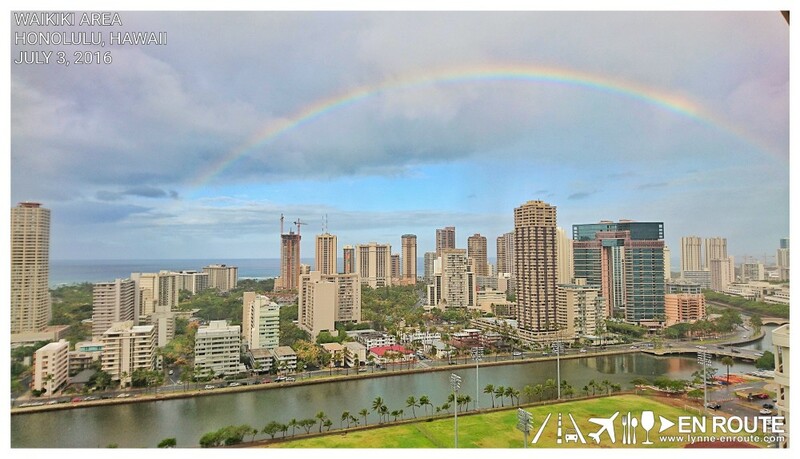 Rain was so gentle, you could even leave your umbrella at home and just let the small drops gently kiss your cheeks as the famous Hawaiian trade winds make sure there is a gentle breeze that makes the place cooler than what the forecast shows. And then you wake up in the morning, and see this from the floor of the apartment that overlooks the Waikiki area of Honolulu. A rainbow? How cliche. And yet, this is pretty much what you signed up for when going to Hawaii. Yep. This is pretty much the definition of paradise. Mind you, paradise has a price. And the price is the unusually high cost of living as compared to some mainland states. Possibly since everything in Hawaii is practically imported (even the fuel for electricity, which they refuse to use cheap coal, therefore resorting to other more expensive sources of power) so just the cost of logistics can ramp up and pass through everything from even the smallest bag of M&M’s you can see at the local WalMart. But reasonably priced things abound here, as long as you know where to look. And we recommend some of it as some of these things will be very much what defines the Aloha life that is Hawaii. One of that is what we sometimes call the McDonald’s of Hawaii: L&L. More of this in the next Postcard!